Welcome to the Blue Lizard! Make this your Sweet Home in Alabama!! The Blue Lizard is Unit 6709 in the Plantation Palms Building. It is a top floor, middle unit, that offers a dazzling view of the white sand beaches and emerald waters of the Gulf of Mexico. The Blue Lizard is a really 'CUTE' condo. It has many upgrades: New Oven, New Furniture, New Flat Screen TV's in each Bedroom and Living room,and of course a Big Blue Lizard! The Blue Lizard does have truly the best view of the beach and Gulf. This condo has a wonderful double balcony, that spans from the living room to the master bedroom. There is nothing better than fixing breakfast, lunch or dinner while looking at the sparkling waters of the Gulf of Mexico. The Blue Lizard is a two Bedroom Condo with a Washer and Dryer in the unit. So now you don't have to pack so much!! The Master Bedroom has a Queen Bed with attached Bath. Let the sound of the ocean waves put you to sleep then watch the sunrise from your bed as you greet a new day. The Beautiful Views from the Master Bedroom truly makes you relax. The Guest Bedroom has nautical decor two twin beds with an attached bath. The Plantation offers the most amenities in Gulf Shores. It has 6 outdoor pools. It has hot tubs, beach volleyball, basketball courts, tennis, shuffleboard,exercise room. The Plantation is the perfect escape from the busy crowds of Gulf Shores. Relax and unwind in this perfectly decorated beach getaway. Please Google blue lizard beach rentals for more information on fun things to do while you are on vacation. * must be 21 to rent property. Other 3BR/3BA property also available - # 335538 Call for rates and schedule. We Vacationed to Gulf Shores 6 years ago, and totally fell in love with the area. It is truly our Sweet Home in Alabama. We purchase unit 6709, we like to call the Blue Lizard and then purchased 5003, the Flip Flop Inn. We have enjoyed creating relationships with all of our snowbirds, as well as many repeat customers year after year. 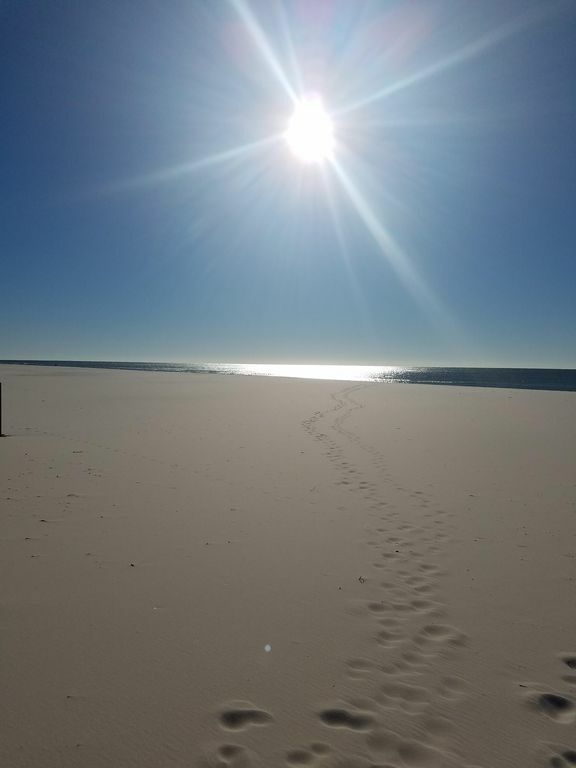 The Plantation is the only resort in Gulf Shores that has so many Beautiful pools and all of the other wonderful amenities..I love the quietness of being on Fort Morgan. You truly are away from it all.. This was our 1st time renting on VRBO. The blue lizard was perfect. It had great views of the beach and ocean and had plenty of pools. Easy checkin check out process and the unit had everything we needed for a great family vacation. We had a very nice vacation away from the snow and cold. Quiet , friendly people lots to do i. The decor in our apartment was fun and colorful. The apartment was clean and quiet .Check in and out was easy. We will be back! We had a wonderful week in September. The room was great and had everything we needed. Great location and communication. I highly recommend staying here if you are traveling to the gulf shores area. The unit was perfect for our last minute getaway. Great views of the beach and pool area from the balcony. And nice views out the front door. The beds were comfy. I’m sure the family room was also but we were either sleeping, on balcony or at the beach. Great place with multiple pools, the beach, a restaurant onsite and a few miles out from the hussle of the main town and beach area. Thank you for choosing to stay with us, Happy you enjoyed your stay! Great, relaxing stay right on the beach with a great Gulf view. The owner responded quickly to our rather last-minute stay request. Upon arrival, we found the Blue Lizard condo exactly as described and pictured online. It was well appointed, VERY clean, and quite comfortable. Beach access is quick and easy. We spent most of our condo time on the large balcony overlooking the beach. We would happily request to stay at the Blue Lizard again. Owner was prompt in all communications from before I booked until the day we left . There were 4 of us (two teens and 2 adults,) and having 2 full bedrooms and bathrooms was a necessity. Oh, and the VIEW! Having a walk- out balcony from both the living room & master bedroom was wonderful. Love the beachy decor . Several pools, hot tub, tennis , grills , etc. Sassy Bass restaurant has good fried shrimp . Weather was perfect , we stayed on beach and in ocean several hours each day . Recommend Adventure Island in Orange Beach and the historical fort in Ft. Morgan (so awesome!) We had an amazing time and appreciate you ! An advance payment of $200.00 is due upon booking. The balance is due 50 days from arrival. The Damage Protection fee covers damages up to $250.00. A copy of your credit card is to be kept on file for damages exceeding $250.00. An extra fee applies if paying by credit card. The resort you are staying at requires a $20.00 registration certificate per vehicle, which is good for the length of your stay. Rates are subject to change until reservation is confirmed.